In anticipation of the Faculty Senate Academic Council Standing Committee’s review of Ways of Thinking/Ways of Doing (WAYS) during the 2018-19 academic year, Stanford students shared their perspectives on the benefits and drawbacks ofthe requirement. 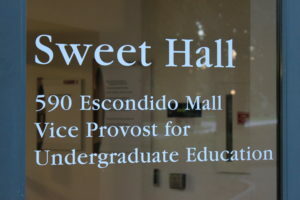 Sweet Hall, home to Undergraduate Advising and Research (DEVON ZANDER/The Stanford Daily). WAYS is a breadth system that emphasizes a liberal arts education, supplementing the classes that students take to fulfill major requirements with ones that emphasize different modes of thinking. The requirement was designed to teach students to act on and perceive the world from various perspectives and disciplines, emphasizing the importance of having a foundation across eight distinct yet integrated domains, regardless of students’ primary academic pursuits. Under the WAYS system, undergraduates must take two courses in Aesthetic and Interpretive Inquiry (A-II), Scientific Method and Analysis (SMA) and Social Inquiry (SI). Additionally, they take one course each in Applied Quantitative Reasoning (AQR), Creative Expression (CE), Engaging Diversity (ED), Ethical Reasoning (ER) and Formal Reasoning (FR). First-year students are often told to explore classes based on their interests rather than worry about satisfying WAYS. A common tip for frosh is that WAYS are naturally fulfilled as they pursue a major. However, some upperclassmen eventually find themselves taking courses based on WAYS requirements. As a pre-medical student, Mani said she entered Stanford with a predetermined set of courses to take, preventing her from thinking about WAYS until fall quarter of her junior year. Certain interdisciplinary majors help students to fulfil WAYS more easily. Fortunately for Mani, HISTORY 140A: “The Scientific Revolution” counts towards the Health Sciences concentration in Society, Technology and Society even as it satisfies either the A-II or SI requirements. However, she noted that an acquaintance with a major in Communication finds it difficult to fulfill SMA, even though Mani has been repeatedly fulfilling SMA over the last two years simply by completing coursework for her major. Some students feel that WAYS can encourage exploration in their freshman year even as they begin to choose a major. For Cindy Jiang ’19, a Computer Science (CS) major who took JAPAN 122: “Translating Cool: Globalized Popular Culture in Asia” to fulfill an A-II requirement, the course sparked her interest in translation theory and the study of differences between languages, causing her to look into a Translation Studies minor. Outside of WAYS, Jiang aims to take at least one class per quarter that is unrelated to her major or otherwise “spontaneous” — WAYS only gave her more reason to do so. Some students suggested that Stanford keep the WAYS system but reduce the number of requirements. Hiser added that CE and A-II WAYS, which sometimes involve courses with associated fees, can be particularly difficult for first-generation or low-income students to fulfill. Hiser also wished there was more communication about WAYS after the initial description of the requirement in the Approaching Stanford brochures. “It doesn’t always seem like the University wants me to think at a higher level of what certain types of thinking mean and how they influence the thinking I do within my major,” said Hiser. Contact Elaine Park at elainep ‘at’ stanford.edu. Elaine Park is a freshman exploring interdisciplinary majors between the humanities and sciences. Besides writing for The Daily, she enjoys journaling for herself and getting hands-on with artsy projects, whether it’s drawing or photography.